Well…Knowlton has made the front page of The Montreal Gazette and then then National CBC Radio! First, a story by Alex Roslin talks about the bylaw restricting garage sales in Brome Lake hit the Sunday Montreal Gazette creating quite a stir! He even quoted DestinationKnowlton.com which is always a welcome treat! In the story he wrote: "As the mercury soars and hockey season draws to an end, Canadians are getting ready for that other great national pastime: the garage sale. Perhaps nowhere has that tradition been stronger than the Eastern Townships village of Knowlton, a favourite destination of antiquing tourists hoping for that rare find because of the many old farms and historic homes"
Only two days after the Sunday Gazette story appeared the CBC Radio One team was digging for dirt trying to see what sort of story they could find in Knowlton regarding Garage Sales. Mayor Richard Wisdom and David Milligan, author of DestinationKnowlton.com appeared live on CBC Radio with Shelagh Rogers in a rather fluffy piece on yard sale "wars"! It was clear that Shelagh and her CBC crew were maybe looking for some fireworks but both Wisdom and Milligan refused to drop down into mud-slinging instead both seemingly wanting to try and build bridges instead of walls. At one point Shelagh Rogers commented that Milligan, typically a "shoot from the hip" type of commentator with flambouyant opinions, seemed to be "sitting on the fence". Both Milligan and Wisdom seemed to appreciate the fact that living in a small town of 6000 people required tact and co-operation while the big city brass at CBC are hoping for titilation. Well, we all have to live here so we need to work together and don't need the big city media to come in to stir the pot...there's enough festering in that cauldron as it is without outside influence!! 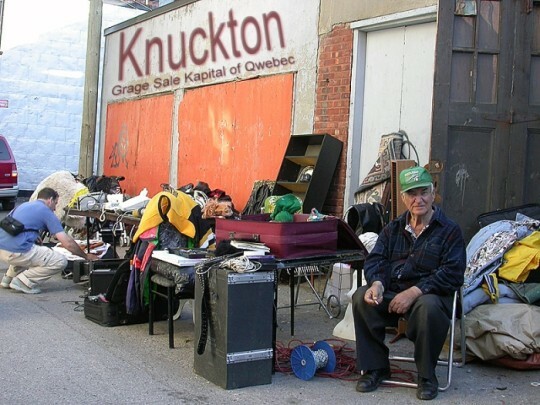 The recently proposed bylaw restricting garage sales was rescinded then modified and now its creating more of a stir as the Montreal Gazette featured a story on Knowlton and the Garage Sale Saga on the front page of the English Language Newspaper. Again the Mayor is saying that the signs make the town look junky. It seems there are signs going up all the time for variousevents, pointed to businesses, announcing a boat or car for sale, all over the village not too mention the endless waving For Sale and For Rent signs that are plopped on every other lawn! First the bylaw was rescinded and then modified and people in Knowlton are wondering what is really happening and if they will be free to go back to selling their junk without of fear of being arrested! UPDATE: The recently proposed bylaw restricting garage sales was rescinded and then modified to be "more liberal" according to the Town. At first the Town bylaw would allow garage sales on only two weekends of the year! There were to be legal garage sales once in May and once in September! This stirred people into a frothy tempest and so many incendiary letters to the editor were written that the local paper had to be printed on asbestos sheets! The new bylaw allows garage sales on 5 weekends of the year. Free permits are available but are required or the garage sale family would be issued a fine. Signs are not permitted on poles but only on the property of the yard sale host! Many people feel this is completely ridiculous as advertising on hydro-poles is the traditional way to announce garage sales, homes for sale, kittens for sale, bands playing, missing persons etc.etc. I am lucky enough to spend a few weeks in January away in the sun; a much needed vacation where I relax and try and forget about the snow of the Eastern Townships. This year we went to the Hawaiian Islands and had a great time exploring three of the islands. Having just returned, we began sorting through the pictures we took for our new travel website TripSister.com, and began coming back to the reality of being back in Knowlton. It's actually good to get home even when you’ve been to Hawaii! But I picked up a copy of the Brome County Snooze to see what had been happening and catch up on the local news and almost spilt my tea! Someone wants to take away our Garage Sales? My first reaction was: "What the #%^&! What's wrong with a good ole fashioned yard sale?" But upon reflection I can see the Town’s side of this…some garage sales and the folks who run them look downright creepy...and they are often hawking the most questionable of junk piled like garbage on spindly legged tables and if I had a neighbor who sat outside all weekend trying to sell their collection of board games and broken electronics I’d likely get fed up…but some garage sales are well organized with good materials for sale that will find new life in someone else’s home. So why toss the baby out with the bathwater? With the sorry state of the roads and bridges and the lake and the schools in the district and with tourism hitting all time lows in Lac Brome how could someone have thought it would be a good idea to make a great Canadian cultural event practically illegal? Many people can’t believe that they want to put the kibosh on Lawn Sales and Garage Sales! Ok...a garage sale is a bit like Karaoke...anyone can sing but that doesn’t mean everyone should sing, but how can anyone legislate people from exercising their freedom to massacre "When A Man Loves A Woman"! Why should the bad singers spoil it for everyone else? 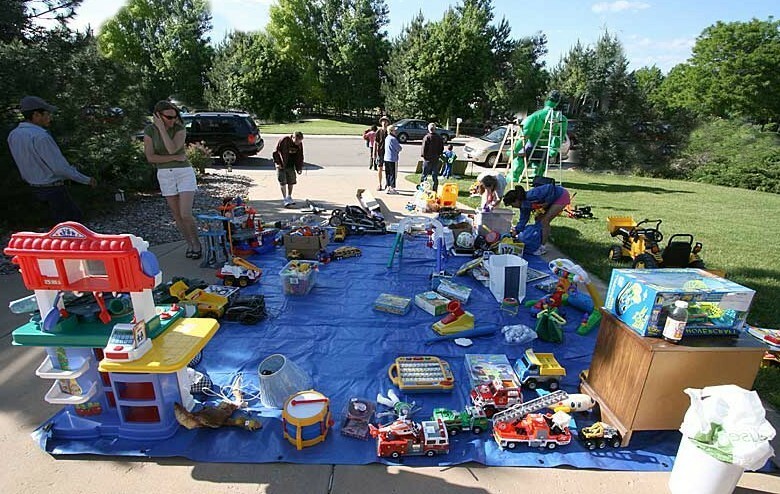 Is the fact that a few yard sale "nincomepoops" don't have the Debbie Travis touch when it comes to laying out the trash a reason to ban every red-blooded Canadian living in Brome Lake from having a cute and cuddly sidewalk sale? Garage Sales are a part of our culture and Quebeckers have turned garage sales in to a veritable art form over the years! People from all over this great country go out on sunny weekends to buy, barter, and meet with friends and neighbors on the great open field of yard sales... exchanging goods and stories in the sweet arena of tax-free small time commerce. Of course it’s no surprise that a Town will find any angle to squeeze tax dollars out of us but this is just downright sacrilegious! Ok, before I go on, let me just say that I often see garage sales here in Lac Brome, Sutton and even Bromont, and I roll my eyes and say to myself “Ouf…ca fait dur!” and agree that there needs to be something done! Some people seem to set up a card table every weekend and sit outside drinking beer hoping to sell their broken hair clip collection! We often see posted signs in August that advertise sales that took place in June. Would it be so hard for you people to remove your out of date garage sale signs? Ummm...apparently so...hence the new bylaw! I can see the philosophy behind the law and actually agree in principal that something must be done to stem the free-for-all flea-market look of some of these set-ups. Some US cities require sales to be held in the back yard instead of the front. That’s a good idea! If something isn't done soon we'll end up looking like some third world market village in the Paris slums! 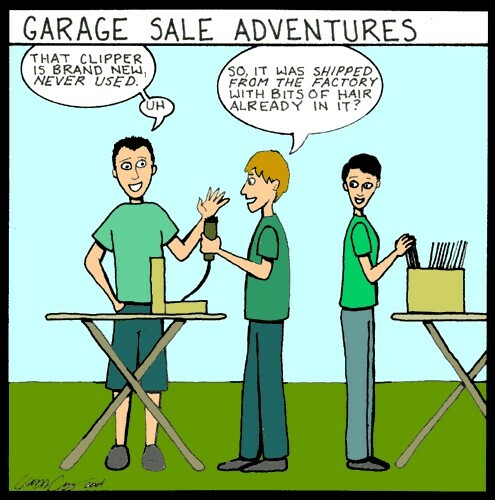 Garage sales are, to many people, a normal part of living in the lower and middle class...a time and place when you don't just toss things out but you go outside and maybe offer your un-wanted items to a friend or neighbour. Hmmm...that sounds ok to many people...so why would the Town of Brome Lake look down upon yard sales? When local businesses drape tattered flags and banners outside their stores, how do the elected "leaders" of the town find the nerve to force the citizens of Brome Lake to stop holding yard sales? Mayor Richard Wisdom said at the meeting that the Town looked messy with all the signs for garage sales being put up all over the place. Some people wonder how does a few fluorescent signs painted with poster paint and decorated with glitter and balloons by children put a scar on this town? Didn’t the Town try and have business owners comply with specific signage rules? I guess since that didn’t work out as well as planned the Town decided to pick on someone less resistant: Mom and Pop and their collection of ebay rejects! The new bylaw will restrict yard sales to the last weekend of May and the first weekend of September. People who want to sell their treasures must purchase a $20 permit at least 15 days before and cannot post any signs. Ummm…can’t post signs? People might as well mail the Town $20 and dump their stuff into the landfill…the results will be the same. While the Town is on such a roll...why not put a TAX on all earnings from garage sales, bake sales, bottle drives and Girl Guide cookie collections? Some people think that these elected officials have overstepped the boundaries of logic...this is Canada after all and last time we checked anyone who owned property had some rights as to what they could do on thier plot. 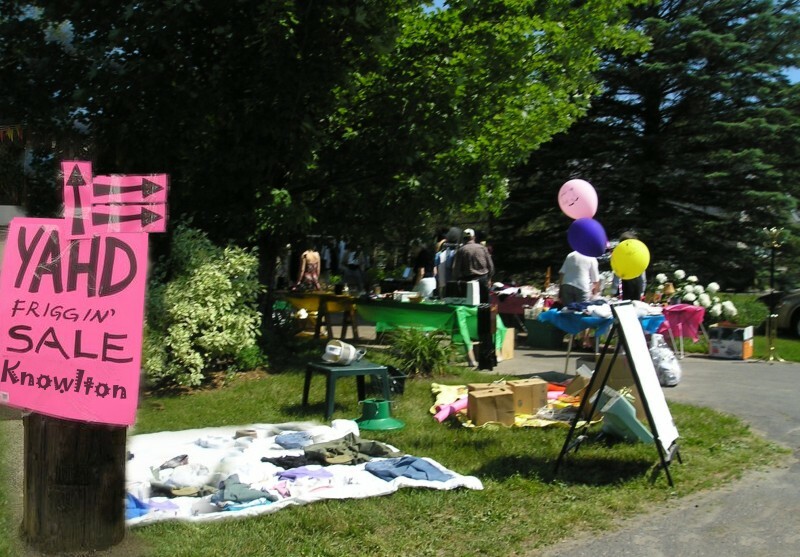 But the Yard Sale "Donald Trump wannabees" have to also realize that every street corner in Knowlton and every utility pole in Lac Brome isn't their own private bill-board for their miss-spelled and gaudy garage sale adverts! Clean-up after yourselves please or else the Town will be more than justified to impose laws...d'uh! Some folks have muttered that this sort of draconian bylaw is so ridiculous it makes many people wonder if some members of this town council even have a connection with the average citizen. Knowlton is more than just wealthy estate owners in a land of gated domains after all! And let’s be fair, there are probably more real estate for sale signs up than garage sale signs on a per capita basis in Knowlton! At least a garage sale; no matter how pathetic the people running it or how worthless their junk, is an indication of life and of people living free. It’s not just the garage sales that look messy either. There are countless examples of how property owners, both private and industrial, are basically not giving a damn when it comes to keeping their properties tidy. Maybe the town needs a liaison officer to be able to make positive suggestions as to how people can make Knowlton look better instead of sending out registered letters and drafting bylaws that should be declared un-Constitutional, or at least un-Canadian! Lawn Sales and Garage Sales have a long historical relevance in our country just like Hockey! What’s next? 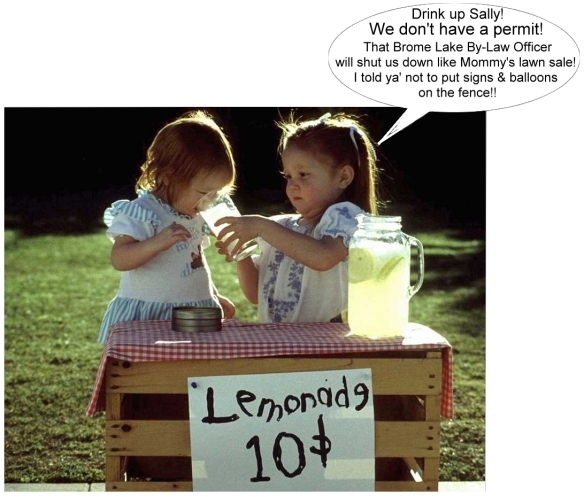 Little Sally on Oak Street can’t have a Lemonade Stand in mom’s driveway because the signage isn’t three-dimensional wood with halogen reflective lighting? Why couldn’t the Town ask people to take the signs down when their garage sales were over and maybe have a public relations person visit garage sales and try and start a new way thinking? Why not educate people how leaving signs all willy-nilly for weeks after the event doesn’t look good…I mean I think everyone can agree with that! It makes sense for people to pick up after themselves and I get a little miffed when I see signs that are out of date. It’s just litter at that point! But it’s not just the slack jawed table jockeys who leave their signs stapled to posts for months after the event! Even the people who ran the Environmental Fair that happened in September 2007 at the Brome Fair Grounds have neglected to remove signage that is, unbelievably, nailed to trees. Some environmentalists! Some comments are that the Town leaders seem to be working in an isolated world; designing a Lac Brome which few locals seem to understand. They feel that the Town should work more with people towards a common vision instead of just imposing laws and rules and bureaucracy and regulations! Whenever I hear about such laws as this this I start contemplating doing one of two things, either packing up my business plans, selling the farm and moving out of Knowlton or else running for Town Council; I haven’t decided! We need to try and teach people although trying to educate the masses on the importance of good taste and tidiness is a Sisyphean task with little chance of success! My suggestion, since you asked, would be to allow anyone to have a garage sale whenever they wanted but they would pay $10 for a permit. They would also be asked to remove all signs when the sale was over and they would be liable for a big fine if they didn’t remove their signage …it’s not hard to find out where to find the offending garage sale owner lives if they don’t remove signs! But not just garage sales; anyone or any organization that puts up a sign to advertise the sale of something or an event should pay a $10 permit and be fined from $50-$1000 if they didn’t remove it. The Town would make millions off of the real estate agents alone if they did that! Oh...by the way…I’ll only give you 10 cents for that broken hairclip! Now that the garage sale law has been taken off the books...maybe this is what we'll be seeing this summer in Knowlton! What's wrong with yard sales? I think whoever wrote this is a total poo-head!